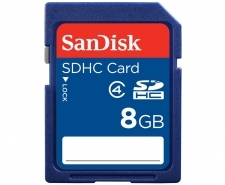 Capture a memory every day on SanDisk® Standard SDHC™cards. It's easy with affordable, quality cards from the minds behind flash memory. For use in all kinds of digital devices with SDHC™ card slots and with a capacity of 32GB, SanDisk Standard cards ensure you have plenty of room to capture and store photos, videos and tunes every day. Plus, they're backed by a five-year limited warranty and priced to give you a lot for a little. SanDisk Standard SDHC cards are built for real life - handling its bumps and turns while capturing life in all its brilliance.